I never remember ever being a fit kid. Many people talk about being really active and fit as a teenager and it was in their twenty's and thirty's that they put on weight. I was fat since I was 5 years old. The situation only got worse as I continued to medicate my feelings with food. When I was 18 I weighed 265 lbs. at only 5' 6" tall. My health improved slightly in high school when I wanted to play the lead part in a musical theater production but the Director told me that I was too heavy to play the part. Thankfully I had a year before they were going to cast the play. I spent that next year running almost every other day and eating a "healthy" diet (lean meats, rice, whole grains, oatmeal, veggies, fruit). During the winter, when it was too cold and wet to run outside, I would step up and down some stairs in my families garage for 30 or 45 minutes at a time. I had some of the most unbelievably painful shinsplints but I kept running because I was tired of being fat. I had a couple of really great coaches at my school who were encouragements to me. Mr. Ball was the Cross Country coach and Mr. Meter was the basketball coach. My high school Cross Country Team did not cut people from the program so I was able to run with the team even though I was horrendously slow. I could barely manage a shuffle at first. I think my first two mile time was 32 minutes. Both Mr. Ball and Mr. Meter took time to coach me along and encourage me. I was unbelievably bad but they cheered me on. Of course, I was so sick and eating so poorly before this that any change would improve my health. I went from 265 lbs to 185 lbs in about 10 months. The change was dramatic. I got stretch marks from heaving that much mass up and down hills, and honestly, I'm proud of them. I worked crazy hard and it paid off. I did end up getting the part in the musical. After this I went to college. I stopped running regularly but I tried to continue to eat somewhat healthy. My weight went up slightly but stayed between 185 and 195 lbs. Eventually I found ballroom dancing and started dancing whenever I could. Over the next couple of years I dropped to about 155 lbs but it wasn't a healthy 155. I was still soft around the middle and I wasn't as strong as I should have been. I tried to get leaner by adding back running but nothing would budge that number. When I turned 25 my weight started to slowly creep back up. I was working a full time engineering job while also finishing a graduate degree. I ended up meeting my future wife and we got married during this time. My activity level has dropped dramatically and the stress of work and graduate school increased. I never go back to the junk food habits of my youth but I was still eating a SAD (Standard American Diet), albeit what I considered a "healthy" one with plenty of veggies, whole grains, and lean meats. Me on my wedding day at my leanest of 155 lbs. A few more years go by and my weight continues to climb. I was pushing 30 and I was back up in the 195 lbs range. I was very frustrated with myself. I tried running again but it did nothing for my weight. I was searching for information on health and weight loss and came across some out there ideas like Paleo and Keto. I give Keto a try. I was 100% committed and followed the advice of "eat to satiety". Well, apparently I was really hungry. I could eat what I felt was a phenomenal amount of food. The upside was that I no longer felt hungry. The downside is that I didn't loose any weight. Honestly this stage in my journey was a relief though because, finally, I could eat until I was full and my weight wouldn't go up. This is when I start diving in to the mechanisms that drive hunger. I listened to every podcast and read all the books I could get a hold of. The medical literature was beyond me but I kept learning by listening to Podcasts and watching talks online. The presentations of Dr. Lustig and Dr. Jason Fung were light bulb moments for me. Everything that I had experienced up to this point was starting to make sense. 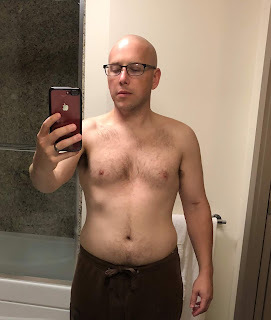 My search continued because Keto had not really worked for me for fat loss. When I ate Keto I would feel full and not gain weight, which was great, but I wanted to be leaner. One fateful day I listened to a podcast by "2 Keto Dudes" where they interviewed Amber O'Hearn where she talked about the Carnivore diet. At the time my thought was, "this is madness." The more I listened though the more it got me thinking. About a year later I was perusing YouTube and come across on interview of Dr. Shawn Baker on the Joe Rogan podcast. Again, I think this is crazy but I was curious. I decided to give Carnivore a try. I would give it a couple of months and see what happened. Worst case scenario I may gain some weight, oh well. I was already dealing with that issue. On September 4, 2018 my carnivore journey began. The first week was easy. I ate steak, eggs, and black coffee. I had one night where I stayed out late dancing and decided to have a slice of pizza, what could go wrong? Oh man, the bloating I felt was unreal. My body was obviously no longer happy with bread. I had stopped eating bread a while before but had never experienced bloating like this before. I felt awful. That was the last time I had bread. It is honestly no longer appealing to me which would be shocking if you knew me in my youth. At the end of the second week I decided to have a drink, just a bourbon on the rocks. Wow, that was not pleasant. My palette for liquor had apparently started to disappear. Pre-carnivore I had loved bourbon. I probably had one every other day after work. Now though, it didn't even taste good. I actually just decided to no longer drink alcohol for awhile because it just didn't sound appealing. I should also note that I was eating what I felt was an absurd amount of food. I was likely putting down at least 3 lbs of meat and eggs a day if not 4 lbs. This felt like an outrageous amount of food for me. I just kept eating though because that was what it took to make the hunger go away. After a month and a half of this my hunger levels suddenly dropped. My appetite cut in half. I asked around the web and the response that I got was that I likely had finally become fat adapted. Cool! What I can tell you was that I ate meat and eggs with abandon and never, ever felt hungry. In fact, I was annoyed by the fact that I felt full all of the time. Another cool thing happened, I dropped several inches off my waist in that fist month. I was stunned that my pants were starting to fall down and that I kept having to cinch my belt tighter. I was eating a crazy amount of food, literally eating until I couldn't fathom taking another bite, but my waist was shrinking. I never weighed myself because I didn't care. I was not trying to loose weight per se, I was trying to loose fat and be leaner. The fit of my clothes would tell me all that I needed to know and they were speaking clearly. I was shrinking in spite of being full all the time. I think that is enough for my fist post. In the next one I'll discuss some of the hiccoughs I experienced in my first few months of Carnivore. There were some challenges I didn't expect but thankfully there were solutions.